The trend for steel, the more affordable and durable watchmaking metal, has been so embraced by watch clients in the last two years that even the top-tier watchmakers have followed suit. Patek Philippe is the latest high-luxury watchmaker to join the bandwagon—this time on a dress watch. While its sportier models, including the Aquanaut and the wildly popular Nautilus, are available in steel, the watchmaker is offering up its first non-limited-edition Calatrava watch in the material since the 1970s. It’s the only steel dress watch in Patek Philippe’s current collection. The Ref. 5212A-001 Calatrava Weekly Calendar is big news for fans of Patek Philippe’s dress watches who want a steel option, or for burgeoning collectors looking for a serious complication without breaking the bank. What’s more, it comes packed with a brand-new self-winding base calibre and a personal, aesthetic touch offered up by one of its in-house designers. Patek Philippe’s ultimate specialty is creating calendar functions—its perpetual calendars were the first to be produced in series and are considered masterpieces. The company also invented the annual calendar, among other trailblazing innovations like an instantaneous day-of-week and date display in its Ref. 5200 Gondolo. 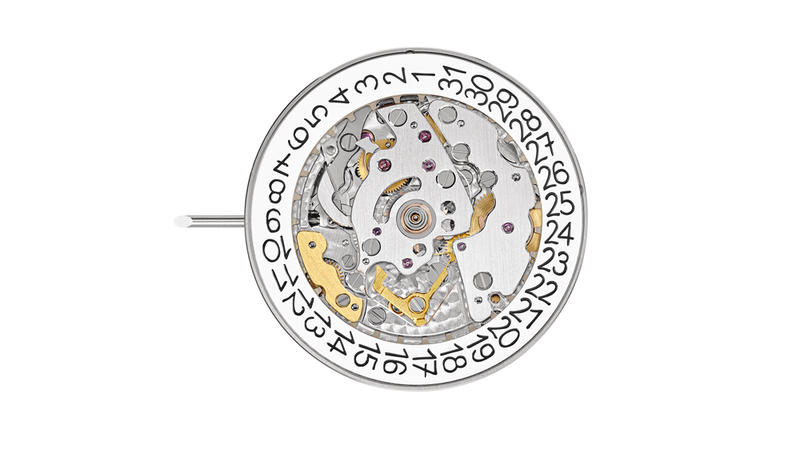 Now, a completely new semi-integrated weekly calendar calibre 26-330 movement—based on the self-winding calibre 324, which took years of development—tells the day of the week, the date at a three o’clock aperture, and the month, and comes with a 53-week indicator. (That number accounts for years with an extra week, which happens every five to six years, with the next occurrence happening in 2020.) While there are few practical reasons one might need to know what week of the year it is, it’s an added bonus for the technically obsessed. For those who also appreciate a poetic flourish, the Arabic numerals on the Ref. 5212A’s silvery opaline dial were inspired by the actual handwriting of one of its designers from the manufacturer. This anonymous employee’s penmanship is so neat it practically looks printed, but close inspection reveals the hallmarks of typically Swiss-French numerals like sevens with a bar crossed through them or the particularly formal way of elongating the hook of the ones. It’s a poignant touch marrying two threatened art forms: considered handwriting and the master craftsmanship of mechanical time. In another retro twist, the Calatrava’s new 40mm by 10.79mm steel case design, baton indexes, and Dauphine-style hands are modelled after a one-of-a-kind 1955 Ref. 2512 timepiece that was held in the Patek Philippe museum for a number of years before it was eventually sold at Sotheby’s in 2012 for around $1,344,350. The new Ref. 5212A, however, is not limited and at approximately $46,720 with a new movement and new calendar function, could be considered a steal—in the Patek Philippe universe at least. It also happens to be one of the best men’s watches in the watchmaker’s 2019 collection—not including, of course, its application minute-repeater pieces, which only top collectors will ever be able to purchase. It's like a full-on party for your wrist.